There is a problem with the solo lane priority that some players express when playing in solo queue. If you are first pick you are entitled to play whichever lane you’d prefer. Consequently, this could result in you wanting to play a solo lane and having the opportunity to win the lane of your choosing to beat your opponent and ride the sweet train of victory. This is not always the case, and my last ranked game was a perfect explanation of why. Our team had first pick. Our player in that position was quiet, didn’t say a word, just banned out champions that generally ruin games (Shen, Blitz, etc) and then picked Sona. Sona is such a solid first pick! Once Blitz and Thresh are out, Sona is not only safe, but she’s also formidable. She has been mentioned in multiple recent blogs and is arguably one of the stronger supports right now. The other team’s reaction to that pick is possibly what won us the game. The other team had two picks, both from people with high queue priority. They decided to choose Mordekaiser and Gragas. Not only does this lock both solo lanes in, but it tells us where Mordekaiser is going, as he can be played both mid and top. 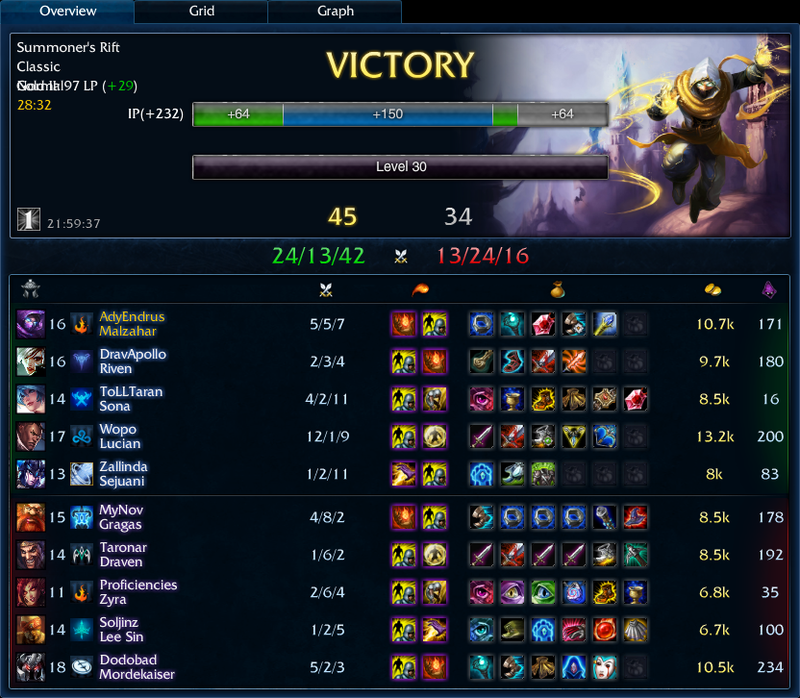 Our team responded by picking our ADC and grabbing the contested pick of Lucian, and then me picking against Gragas. Malzahar doesn’t counter Gragas, I simply picked a champion that wouldn’t get pushed into its turret against Gragas. I felt confident on Malzahar, and so I picked him up because I could do well against Gragas or Mordekaiser if we needed to swap lanes. Now the other team picked their jungler and ADC. Again, they could have picked their support and ADC and left their jungler for last pick. This was possibly the result of someone’s small champion pool, or someone unwilling to trade in solo queue. Maybe it was just the way we lined up in queue that worked out well for us, but due to our first pick not pushing for a solo lane priority they were able to be a major “support” to our team effort and helped us win. I picked up first blood against Gragas thanks to a perfectly timed counter gank by Sejuani. I did have to Flash and Ignite for the kill, but Gragas had already used his Flash as well, so it was basically guaranteed. If Lee would have been maxing Safeguard then Gragas may have lived, but that was not the case. I jumped out to a 4-0 start, wreaking havoc on top lane, mid, and bot lane; I was spreading the love! My double kill in bot lane was what ended my spree. After I had Flashed to finish off Zyra I turned back and finished off her ADC under his turret. I took too many tower shots, and found a fat man waiting for me in the bushes. Further was just a master of metal, so I gave my bounty to Gragas. I had other opportunities to pick up kills throughout the game, but opted to hand them off to our Lucian. I had a pretty mean combo on Draven, who continued to run towards our base rather than towards his own base. I walked with him, spamming laugh, until my Lucian caught up with us and finished him off with a couple auto attacks. Sejuani and I were able to do a ton of work to Baron. Lucian came to assist us eventually and we finished off Baron. Middle inhibitor was already down, so we stood in top lane. We actually caught Lee Sin out, killed him, and then just rushed in 5v4. Surprisingly that worked. Lee was pretty upset at Draven, I guess he felt like he didn’t contribute in team fights enough. One kill and two assists may bring some truth to Lee’s statement. Lucian did get shut down eventually. I didn’t press R on Mordekaiser quickly enough and he was able to ultimate on Lucian. The burn from Morde’s ultimate finished Lucian off after Mordekaiser was dead. I ultimately believe that the pick order of going for solo lane priority picks first caused the other team to lose.